Nestled in the beautiful mountains of Western North Carolina, Wolf Ridge Ski Resort has tremendous offerings for the ski and snowboard enthusiast. Whether you are a beginner or expert, long-time regular or first-time visitor, you are certain to find exactly what you are looking for at North Carolina's premier snow sport facility! Carolina Mornings now manages Scenic Wolf Resort! Our luxury cabin rentals are located on the slopes of the Wolf Ridge Ski Resort. Special offers, deluxe accommodations and personalized service is a primary focus. 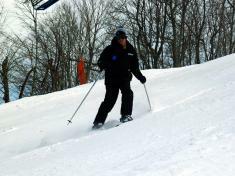 Come stay slope-side at Scenic Wolf Resort when you ski Wolf Ridge!